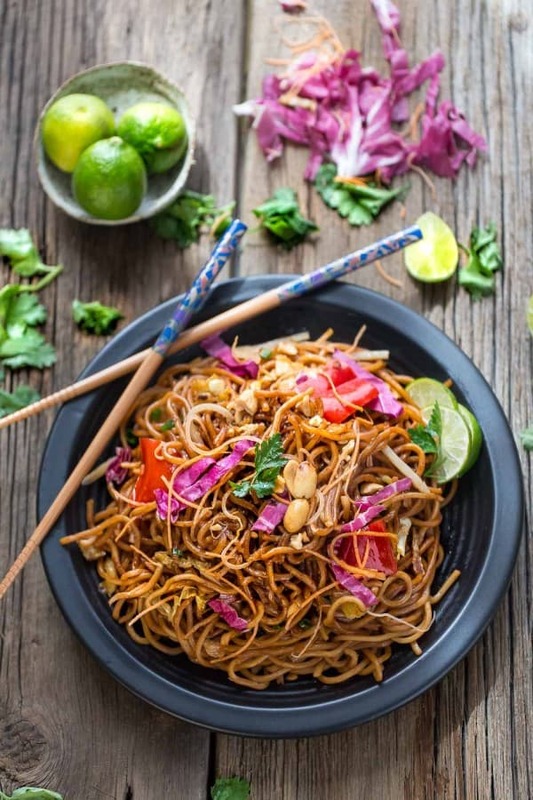 Rainbow Asian Peanut Noodles makes the perfect easy weeknight meal full of bright and healthy vegetables. Best of all, it takes less than 30 minutes to make! My family would be completely happy if I made them noodles or pasta every night. I love how many fun and tasty ways you can change them up and it makes the perfect dish for using up all those extra ingredients lingering in the fridge. 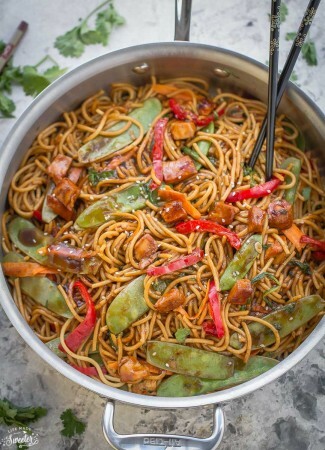 These Rainbow Asian Skillet Peanut Noodles are so easy to make and takes less than 30 minutes to come together. Perfect for a meatless weeknight meal but still flavorful and pretty enough to impress your weekend guests. Best of all, you can completely customize the veggies to your liking and add in some protein of your choice. 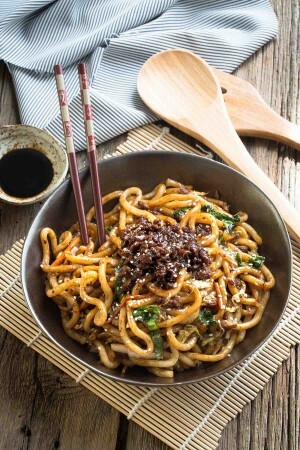 It’s also easy to make them with your favorite noodles you have on hand. I used gluten free spaghetti but this dish would work equally well with regular pasta noodles, rice noodles or even zucchini noodles. 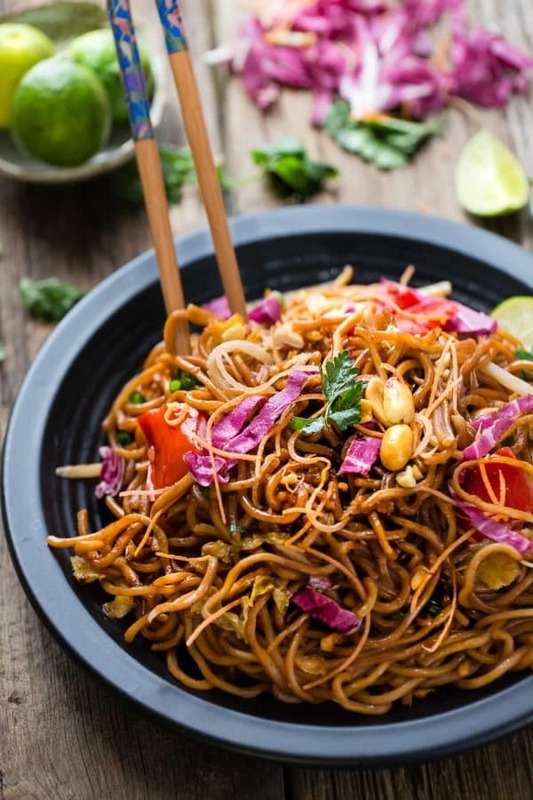 We start out by making the sweet and savory peanut sauce and while your pasta is cooking, sauté the vegetables – then add the cooked noodles back into the pan and coat well with the sauce. For the vegetables, I used red cabbage, bell peppers and threw in some shredded carrots. Once all the ingredients are well coated, top with some roasted peanuts and some cilantro. We usually add some chili flakes and Sriracha sauce but feel free to leave those out if you don’t want any extra heat. So easy and delicious and a great way to sneak in all those colorful and healthy veggies. Just grab your chopsticks or a fork and dig in. 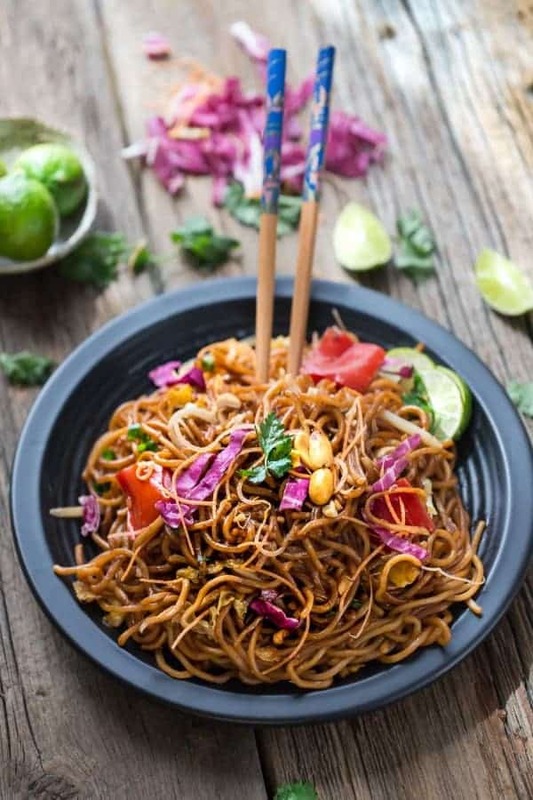 Rainbow Asian Peanut Noodles makes the perfect easy weeknight meal full of bright and healthy vegetables.Best of all, it takes less than 30 minutes to make! Set a medium pot of water to boil. Add pasta noodles and cook according to package directions. While the noodles are cooking, in a medium bowl, whisk together the sauce ingredients adding the hot water last and mix until combined. Heat oil in a large skillet over medium-high heat. Add minced garlic and sauté for about 10-20 seconds until fragrant being careful not to burn it. Add remaining vegetables and sauté for 4-5 minutes or until tender, stirring occasionally. Add the cooked pasta and peanut sauce to pan and toss to coat the ingredients together. Add 1 tablespoon of chopped cilantro and toss to combine. Season more with salt or black pepper to taste if desired. Sprinkle with green onions, remaining cilantro and sesame seeds if desired. For a thinner sauce, add another 1/4 cup of water or chicken broth to the sauce.